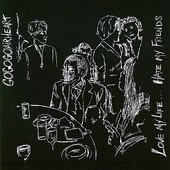 Spastic, loud, uncontrollable rock music with a flare for the bombastic, GoGoGo Airheart's Love My Life... Hate My Friends is a dynamic assault of all things indie, a classic hipster record that actually stands up under closer inspection. They're cool, they're cute, and they play it loud, so a buzz was generated. But the music on Love My Life... Hate My Friends stands up against all odds, carelessly and recklessly thrashing through semi-melodic, propulsive rock music like nobody's business. I'll give it a B.